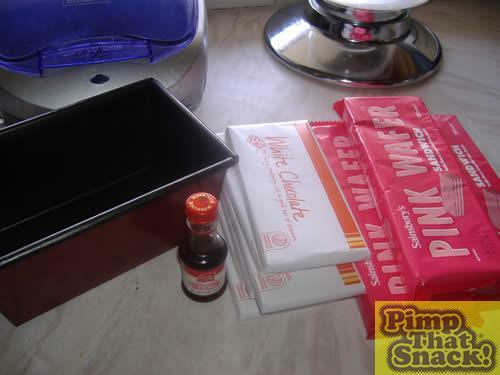 The pink wafer is also wondrous thing – always the most popular in a packet of Tea Time at Christmas, and yet if you bring a packet into work, everyone complains that they aren’t chocolate Hob Nobs. So, the king of biscuits meets the king of chocolate bars… surely no better tribute to the King of Rock n Roll himself, Elvis Presley. But how to make a chocolate bar fit for a king? Why, model it on the King’s car of course! And thus the Pink Kit Katillac was born. First of all, get yourself a decent loaf tin. Mine isn’t really the proper shape, as it’s quite squat, but to be honest, this pimp is not about making a bit version of a Kit Kat chunky, but about making a tribute, and therefore, it can be any damn shape I want it to be. To start with, melt all your chocolate. Now I don’t hold with all this melting in a glass bowl palaver. My microwave handbook says you can melt chocolate in it, providing you have a decent microwavable bowl, and that you stir every 30 seconds. I think the mistake novice chocolate melters might make is that a microwave carries on heating food once the food has been removed, so you have to take it out when it’s almost melted, and leave it for a bit. That way you won’t get a “hunka burning” chocolate. 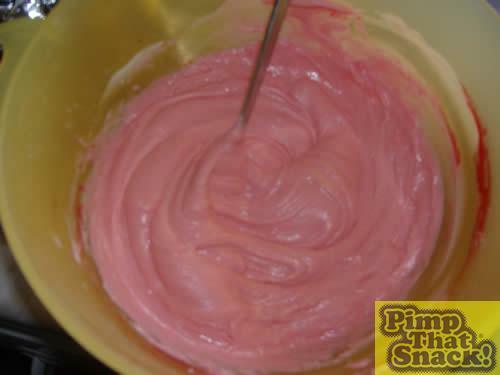 Once the chocolate is melted, get that pink food colouring in. 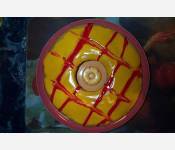 Make it as garish as you like, the King enjoyed flamboyance, and so should you. 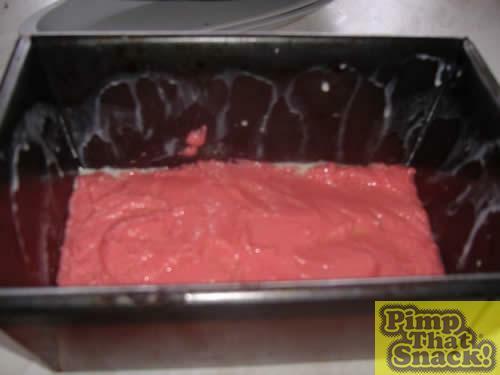 Put a layer of pink chocolate on the base of the loaf tin. Don’t use ‘Too Much’ like I did cause you won’t have enough for later on.